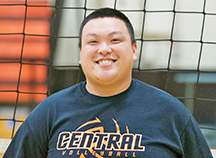 Tina is entering her 9th year as a coach for Central Volleyball Club. She is currently the 12-Gold Head Coach and has previously coached at El Captain Middle School and Glacier Point Middle School. She watched her daughter play in the Central Unified District as well as the Central Volleyball Club and finds it extremely exciting and rewarding to watch her players grow throughout the season. Each year, Tina strives to lay a strong foundation for the players to build upon as they continue their volleyball careers. If you have a daughter playing at the 12's level, she looks forward to meeting you both and having a great season! This is Lynn's 4th year as an assistant coach for CVBC. 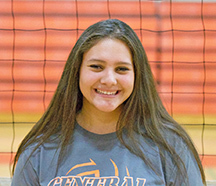 She played volleyball at Central High School as a Libero and loves the game. Her coaching experience also includes being the Head coach for both the Frosh and JV teams at Central High School. She is a great assistant to Coach Tina and will continue helping her develop our younger athletes. Lisa became involved with the Central Unified School District when she made the volleyball team in 7th & 8th grade at El Capitan Middle School. She played as a Defensive Specialist all 4 years at Central West High School. Her passion grew stronger for the game after her first Assistant Coaching position at Roosevelt Elementary School where she helped coach her 5th and 6th grade daughters. She has coached at the elementary, middle and high school levels for 11 years. This season she is coaching the 12U Silver team. All of the teams she has coached have finished at upper levels. Lisa strives to emphasize strong fundamentals and aspires to push her athletes to work hard and be both physically and mentally strong. She looks forward to coaching this season and increasing the confidence of her players in all aspects of the game. GO CVBC! 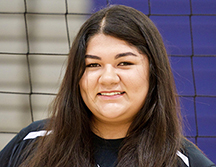 Amanda started playing volleyball in the 5th grade at Roosevelt Elementary School in the Central Unified School District. She played for Central Volleyball Club for 5 years starting at the age of 10. She was a strong utility player and played as an outside hitter, opposite and defensive specialist. Amanda ended her volleyball career her Sophmore year in high school to puruse her love of animals and became a member of Fresno-Central FFA. Her love for the game has always been strong and this will be her third year coaching for Central Volleyball Club. She loves being involved in the volleyball community and looks forward to helping players exceed their goals and expectations. Kendra is entering her 7th year as a coach with Central Volleyball Club. She has coached at the 12U and 14U levels with currently going into her 3rd year as the 14-Gold Head Coach. 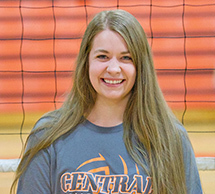 She has played eight years of volleyball, including 4 years at Central High School. She has also gone through the Central Volleyball Club as a player and is committed to it's continued success. She enjoys being able to teach the girls the skills that she has learned and finds it very rewarding to watch them grow in their young careers. I'm excited to be here as this is my first year of coaching club. I started playing in 2005 at Rio Vista as an outside hitter and played defensive specialist at Central High School. I love the passion of the game and have been playing for 13 years. I have assisted for 3 years at Central High School and am now the boys JV head coach and girls frosh assistant coach for the past 2 years. I'm looking forward to helping develop their skills to reach the standards needed and teach players to love more about the game of volleyball. I have been involved with the sport of volleyball since I was 10 years old. I played at H-K elementary school, El Capitan Middle School and Central High School, as well as at CVBC for many years. I began coaching five years ago at many levels of play from Elementary School to High School. This will be my fourth season coaching at Central Volleyball Club. I have tremendous passion for the sport and look forward to forwarding the skills and love of the game for my team. This is Shanea's second year as an Assistant Coach for Central Volleyball Club. She started playing volleyball at 12 years old and played at Central High School. Shanea played club volleyball here at Central Volleyball Club as an opposite and middle blocker. She is currently in her second year at Fresno City College Last season her and the FCC rams battled and became State Champions. She has received awards for outstanding middle blocker, most valuable player and best offensive player. Shanea is a great addition to our coaching staff and is looking forward to the season. 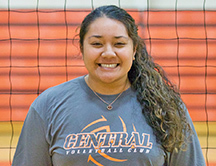 Salamasina enters her 5th year coaching for Central Volleyball Club. She co-coached the 18's Gold team, was a 13 Gold Coach, the 14 Silver Coach and assistant on the 16's Silver for CVBC. In 2015, she coached Atwater VBC 16-Power. She started playing 14 years ago with Central Volleyball Club and played on the 12U, 14U and 18U teams. In 2011 she played at Central Cal 16 Gold team and a year at Mid-Cal Xtreme 17-1, before returning to CVBC 18U for her final year of club volleyball and high school. Played at Central High School, as an outside hitter she moved up her freshman year for playoffs and played on varsity her remaining year of High School. Her junior year, she made honorable mention and made All-Conference her senior year for TRAC and was also Central's MVP offensive player in 2014. A graduate of UC Merced, she was recruited as a utility player and played all 4 years as a Defensive Specialist for the Bobcats. She has helped lead the Bobcats to the PAC playoffs all 4 years at UC Merced. We're excited she is back and will bring Central Volleyball Club a wealth of knowledge from her club, high school and college playing experience. She's looking forward to helping her players succeed in every aspect of the game on and off the court. This is my first year being an assistant coach. I am a Senior at Bullard High School. I have played volleyball since I was 9 years old and currently playing at Bullard. I started playing club volleyball in 7th grade. My first year of club I was a middle blocker and over the years I was moved to outside hitter, libero and defensive specialist. During my high school season, I was a setter for all 4 years but currently I am also playing libero and defensive specialist. I am very excited for this year’s club season. I look forward to teach and share my knowledge of volleyball to younger players and hope I can help them succeed in their volleyball careers. Meigan is entering her 8th year as a coach for Central Volleyball Club. She has coached 12U-16U for CVBC and has experience coaching at the high school level. Meigan played volleyball for 10 years and continued her volleyball career after high school at Fresno City College. She played as a setter for most of her volleyball career and all her club volleyball years were spent with CVBC. Meigan has a strong love for the game and is thankful every year for the opportunity to pass on her knowledge to young players. She hopes to not only help them grow as players but also as individuals and to teach them to work together as a team. Joanna has been coaching for 14 years and has been a member of Central VBC since 2004. She has also coached 12 years for the middle schools at Central Unified School District. She played 4 years on varsity as an outside hitter and setter at Mt. Eden HS in Hayward, CA. She made first team all-league her junior and senior year. She was selected by unanimous selection, all conference for the Hayward Athletic League and MVP 1990-1991 and lead her team to the CIF North Coast Section playoffs three times. She played club volleyball her last two years of high school for East Bay Connection VBC. She played an additional two years for Chabot College, and helped lead the Gladiators to a Golden Gate conference title in 1992-1993 and to the state playoffs. 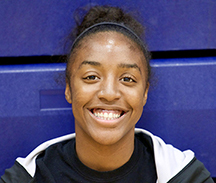 She played a year at Cal State East Bay before she sustained injuries that abruptly ended her playing career. Her passion for volleyball is what led her to ontinue coaching and having the ability to express ALL fundamentals of volleyball she’s learned throughout her past playing and coaching experiences.